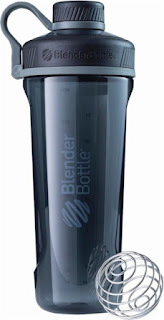 Today only, while supplies last, choose one of these BlenderBottle 32-Oz. Water Bottle/Shaker Cup for ONLY $4.99 (Retail $14.99+)! Simplify morning meals with this 32-oz. BlenderBottle bottle. It comes with a wire whisk for smooth blending of shakes and smoothies, and the durable plastic material resists stains and odors for a consistently cleaner drink.